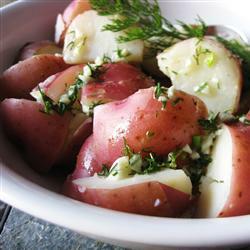 Place the potatoes in a steamer basket, and set in a pan over an inch of boiling water. Cover, and steam for about 10 minutes, until potatoes are tender but not mushy. In a small bowl, stir together the butter, dill, garlic, and salt. Transfer the potatoes to a serving bowl, and pour the seasoned butter over them. Toss gently until they are well-coated.